Looking for a simple way to reduce labor cost? Lenbrook provides high quality two way radios in the industry, both our Motorola and Vertex Standard two way radios allows for companies in an industrial working environment the ability to minimize downtime and increase productivity. We provided 3 different scenarios listed below where we have outlined the cost savings of using two way radios. We believe it is an easy way for companies to get a quick return on an investment without spending alot. The ROI is based on $300/radio per worker. Case scenario based 8 hour work days, 260 workdays per year. Stop and think how much time you actually waste. Ask yourself these Questions? Do you waste time trying to find and talk to workers? How long it takes to get a forklift to move a pallet? Locate missing inventory and or drop off shipments? Getting in touch with maintenance when machinery beaks down? Staying organized while in peak hours? These are daily occurrences on job sites. These inefficiencies can be eliminated giving you the opportunity minimize downtime and increase productivity. Whether your business involves general industrial construction, commercial or residential construction or you’re are an electrical, carpentry, HVAC or plumbing professional Lenbrook has the right solution for you. spot in the dark, especially if it falls on the ground. like Transmit Interrupt, Radio Inhibit and Remote Monitor. 3. Use it as the “EMERGENCY RADIO” in a school campus environment since the only yellow EVX-S24 radios might be programmed by the EMS department for interoperability with the local public safety responders. may be exposed to weather, such as security,maintenance and pool lifeguards. 5. Use it as the “SCHOOL-BUS-YELLOW” radio for all the workers around the parking lot who receive students in the morning and send students home in the afternoon. 6.Use it as the “CONSTRUCTION-YELLOW RADIO”at the job site because it’s similar to the many black-and-yellow tools your crew already uses. 7. Use it as a “STATUS SYMBOL” – an obvious differentiator of rank amongst the workers on the team.He or she who holds the yellow EVX-S24 radio is clearly recognized as superior to the rest of the workers and even to the customers of those end-users. 8. Use it as the “EMERGENCY PAGER THAT TALKS”. The yellow EVX-S24 can be assigned to the highest-ranking volunteers who will take command. 9. Use it for workers who place the EVX-S24 on the LAPEL AREA of their uniform. 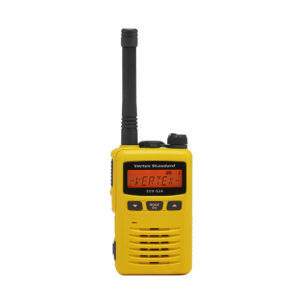 The yellow colored radio offers a highly visible way to quickly identify those key users. the competition. Once your customer is convinced they need a yellow radio, the EVX-S24 will be the best(and only) game in town!